It all starts with the yellow leaf. Our guide points it out — one out of every hundred leaves or so on the mangroves growing out of the water in Key West, Florida, is a waxy yellow among the green. My family and I are on a kayaking trip through the mangroves which support much of the ecosystem in the salty waters surrounding Florida. One could also say that the mangroves support Florida itself — the land, that is. Mangroves, by virtue of their flexibility and position in the water, protect the land from hurricanes and even play a part in building up and stabilizing land by accumulating debris in their roots. Such ecosystems are declining around the world because of climate change, overharvesting and pollution — but here, as they tower around us, it’s hard to imagine. Red mangroves, like the ones we’re exploring, have carved out a unique ecological niche for themselves. By growing in saltwater, they take over areas where many other plants cannot grow — but with this comes a unique problem: getting rid of the salt. And that’s where the yellow leaf comes in. According to our guide, who points them out as he paddles in front of us, these mangroves filter out some salt at the roots and channel the excess into so-called ‘sacrificial leaves,’ which turn yellow and fall off of the plant. Some scientific evidence discredits this claim — while the idea has been held for some time, studies have found that 90 to 97 percent of the salt is eliminated after passing through the roots. The yellow leaves also don’t have a measurably higher salt content than the others, although yellow leaves appear to be older and older leaves generally contain more salt. Nonetheless, as we travel on, we continue to see the yellow leaves floating frequently in the water, settling below or getting caught in the plant’s tall, arching roots. 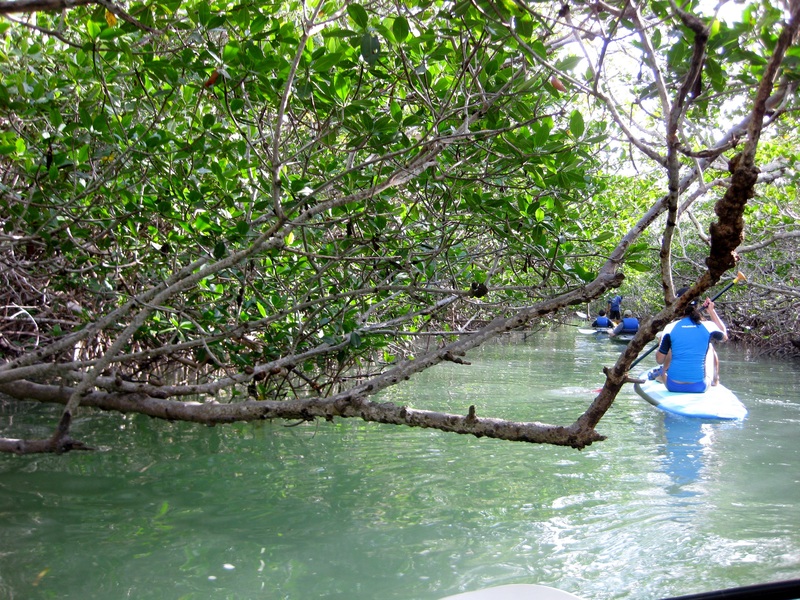 Red mangroves are held aloft by large roots — perfect for getting the nose of a kayak stuck in. An unusual environment calls for unusual adaptations, and the red mangrove’s stilt-like roots — that lend the mangrove its nickname as ‘the walking tree’ — not only filter out salt but also allow enough room for oxygen and other gases to reach pores in the bark. 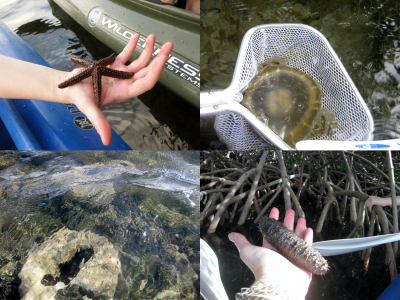 In the meantime, the roots accumulate silt, fallen leaves, and other debris, creating a sheltered breeding ground for everything from baby sharks to crabs to the majority of the fish that live near the Florida Keys, as well as providing permanent homes for sponges, sea cucumbers and sea stars. Some of the wildlife we encountered as introduced by our guide, clockwise from top left: a sea star, an upside down jellyfish (when underwater it rests with its tendrils facing upward to feed), a sea cucumber and a (tire-sized) sponge. Periodically our guide has us all stop, grabbing onto mangrove roots and each others’ kayaks, and pulls up some of those inhabitants. Each of them comes with its own story, like sea cucumbers that spit out their internal organs in self-defense (they can grow more) or tiny crabs that scuttle like spiders along the mangrove roots. Mangrove roots press in close as we go through a narrow channel. Among the dense roots I also spot thin vertical sprouts — unattached, but growing out of the same fertile silt. These sprouts come from the mangrove’s long, pencil-shaped seedlings, which come to life while still attached to the parent tree. They orient themselves vertically to grow when they encounter good conditions, whether in the shelter of its parent tree or far away, and they can linger for up to a year without sprouting. 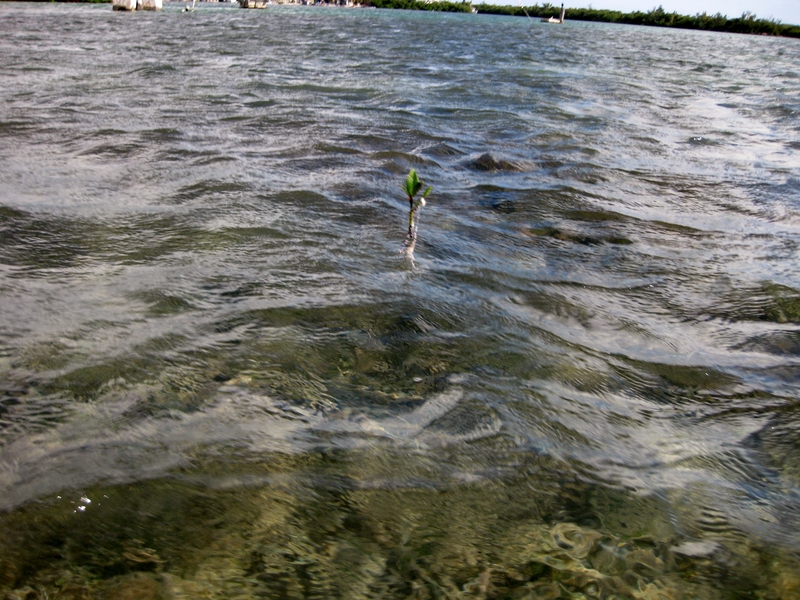 A mangrove seedling takes root on its own. Red mangroves like these provide a nurturing ecosystem, protect nearby land from strong currents and erosion and slowly build upward — even to the point of forming higher ground, says our guide. He points out that there are different types of mangroves primed to take advantage of this elevation — each with their own, different adaptations. 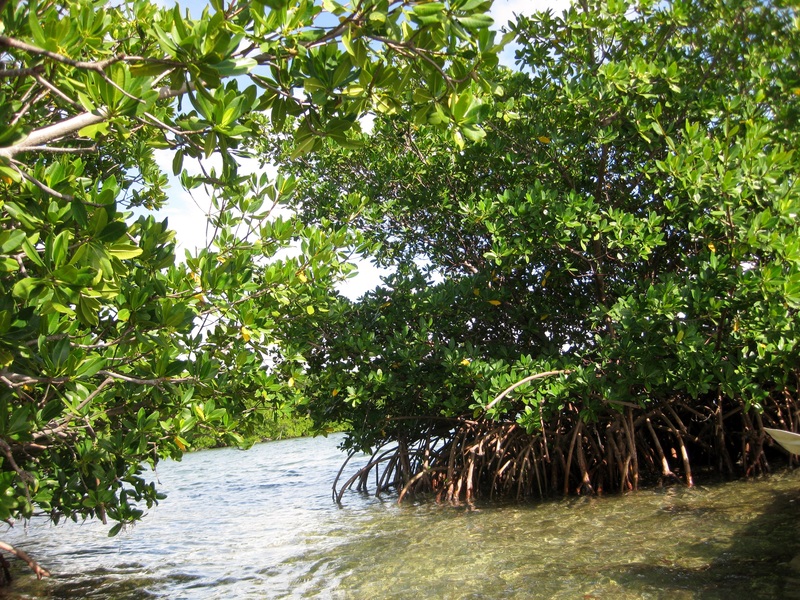 Black mangroves grow slightly closer to shore than red mangroves and send up thin tubular roots to absorb oxygen and exude salt from their leaves. 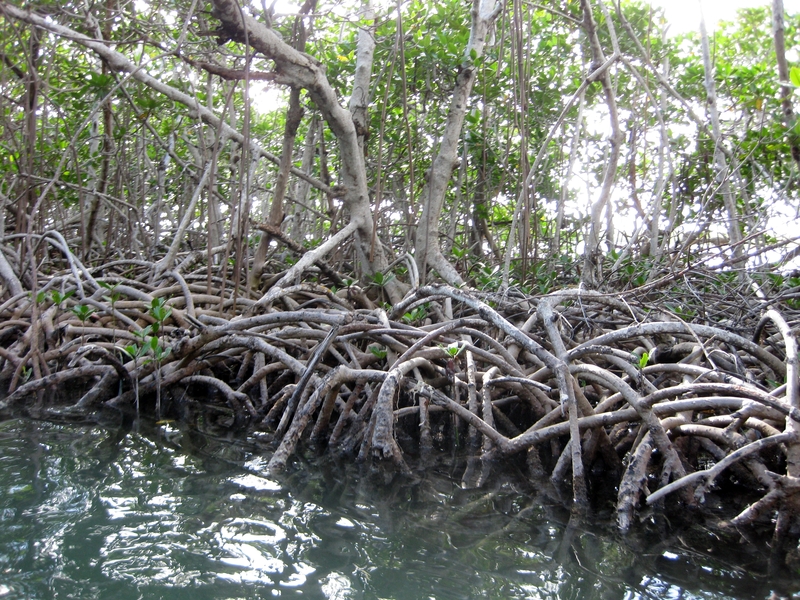 Closest to shore, white mangroves resemble conventional trees the most and only sprout breathing tubes or tall arching roots when they need to keep above the tide. Following paddleboarders through the mangroves. But here, away from the shoreline, is the domain of the red mangroves. As we maneuver through them I’m struck by their sheer expanse: a whole world propped up above the water, and in two hours we’ve only just begun to grasp its rules. As we finish the tour, we pass through those yellow leaves strewn about the water — what secrets do they hold? Perhaps the bird captain knows the answer. Editor’s note: This post is part of a mini-series in which Scienceline reporters write on location from around the globe during winter break. See related posts for a story on birdhouses in Oregon, and check back this week for an account of two important museums in Washington D.C. and a report on climate change preparations in the national parks of Alaska. Mangroves are also an incredible habitat for birds. 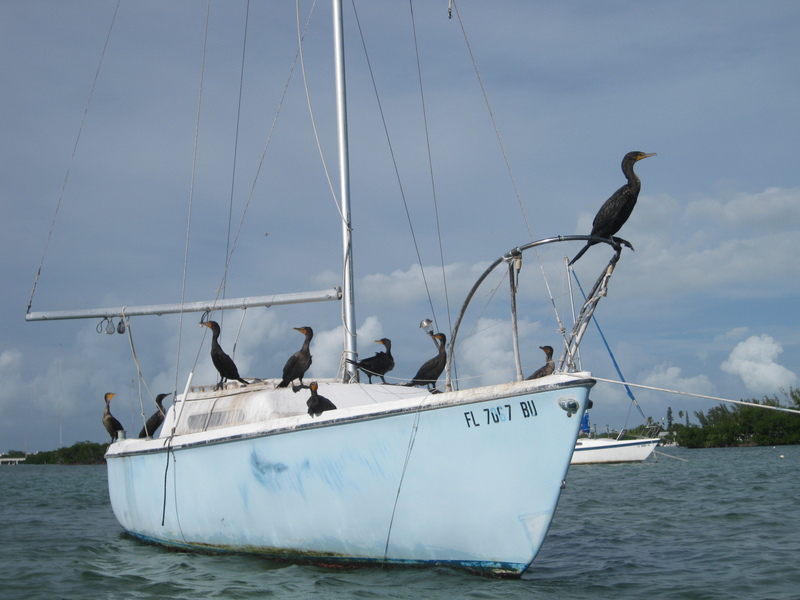 It is also where birds and other animals/mammals go during bad weather to protect themselves. 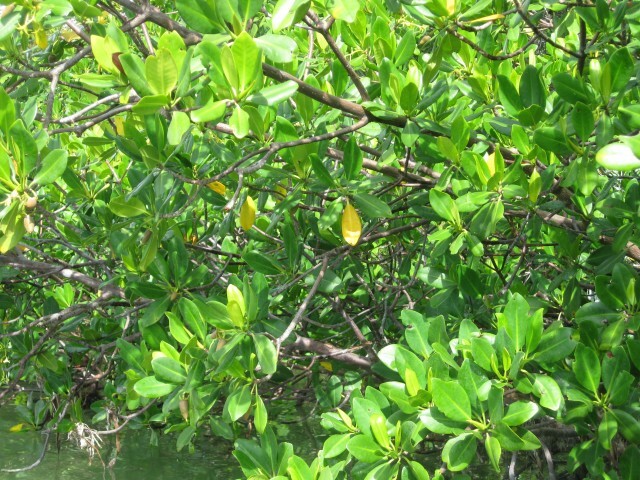 The yellow leaves are the oldest leaf in the mangrove leaf cluster. They become yellow as the tree withdraws chlorophyll and other molecules it wants to keep and the carotene and xanthin pigments become visible. Dead end metabolites and other waste materials are put into the yellow leaves. The waxy coating is removed and the leaf is dropped with a much higher Nitrogen to Carbon ratio than a green leaf. This makes the yellow leaf a great source of food for detritivores. In red mangroves most of the salt including other elements like sulfur, is excluded and never passes through the roots into the xylem. Over time this can leave a salt trace that outlines the root location even after the tree root disappears.